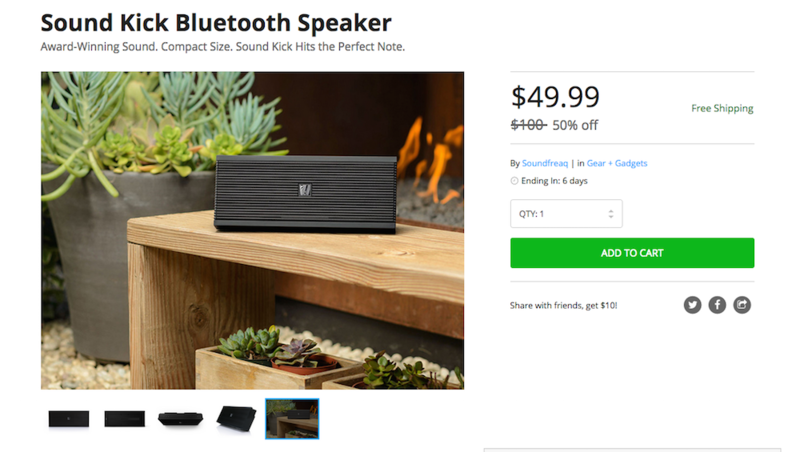 Ending in six days, you still have time to pick up a Sound Kick Bluetooth Speaker through the DL Deals Store for $49.99, down from its MSRP of $99.99. The Sound Kick features Bluetooth connectivity, allowing you to wirelessly enjoy your music for up to 7 hours before recharging is needed. Music playback and volume can be controlled directly from the speaker, or from the device you are streaming from. In addition to Bluetooth, you can also quickly connect any device with a 3.5mm headphone jack. You will also be happy to see that the Sound Kick speaker is rated very highly on Amazon, priced at just under $100. So for 50% off, this is a pretty good deal. If this speaker interests you, hit that deal link below.